I’ve had a voice on Twitter and Facebook for a while now. 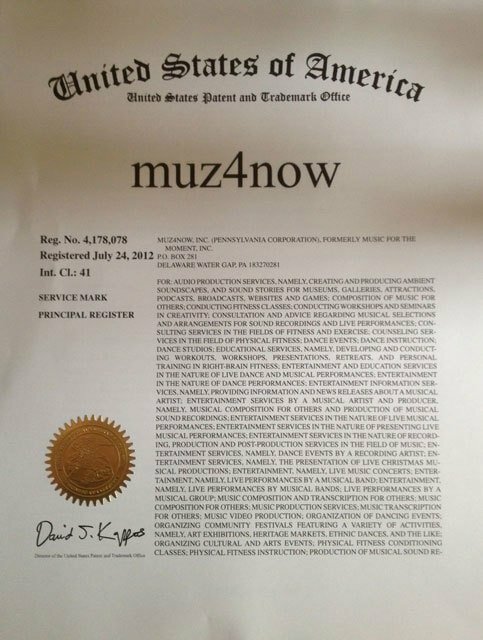 So, when it came time to “choose” a new business name, it came naturally to use my social media moniker of “muz4now™”. This play on words was something that I came up with as a shorthand for many of the things that I work with in my creative, artistic pursuits: music, the muse, and improvisation with its close relationship to the present moment (“now”). Over time, this little made up word began to hold a kind of magic for me that would allow me to broaden my view of what I’m about in terms of creativity. But, until recently, muz4now was not my business name. On Good Friday, 2011, I received a FAX and phone message from a lawyer saying that another musician was prepared to enforce a cease and desist request regarding her trademark on my business’s former name. In other words, someone was going to sue me if I didn’t get rid of the old name. These short months since April have been a long, hard ride in terms of learning more than I ever wanted to know about trademark law and branding; conversing with and paying for an excellent trademark lawyer; grieving the loss of a name I had loved and used for 10 years; and pushing through the frustration of having to rebuild brand/name recognition. And it truly is official now. Filed with the Commonwealth of Pennsylvania and the USPTO. (By the way, if you’re in business for yourself, be sure that you know the law about being in business and branding. Otherwise, you need to have a good lawyer on retainer.) Hopefully, you won’t get as bored as I will of seeing the ™ after muz4now™. In our litigious society, we have to be smart business people even if our real desire is to create beautiful art and practice lives of artistry. Welcome to the new muz4now web site. The name may not initially gain any SEO credits. But it’s probably not a huge target for trademark suits, either. My goal on this site is to provide you with useful information about music and arts (mine and friends of mine) and “the business” of being in this creative work. Stop by often. Friend me on Twitter. Join in the business and the fun! You’re very witty, Wes! I really appreciate your support. Pingback: Indie Spotlight: Stan Stewart - Riffraf. Riffraf.